Shown here are two imperially-commissioned portraits of the prominent Lama Shakya Yeshe (1354-1435), one of the eight greatest disciples of Tsongkhapa, the founder of the Gelug order. In 1408, Emperor Yongle, of the Ming Dynasty, sent an invitation to Tsongkhapa to visit the Ming capital. Tsongkhapa refused the invitation, so in 1413, Yongle sent a second invitation. This time, Tsongkhapa delegated Shakya Yeshe, who arrived in Nanjing the next year. There, he built temples, initiated monks and, in 1415, was given the title Da Ci Fawang (Tibetan: Byams chen chos rje, "Dharma King of Great Loving Kindness"), one of several princely religious titles given by Yongle to great Tibetan Lamas. 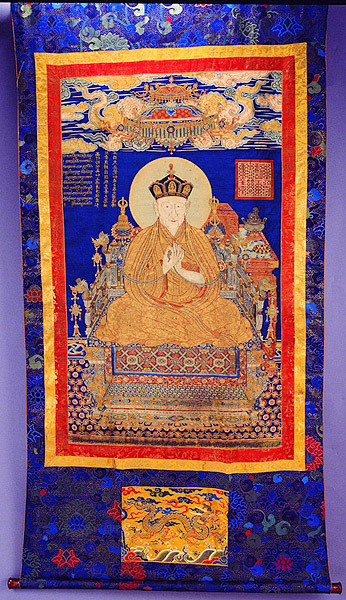 Shakya Yeshe received bountiful gifts from Emperor Yongle, including a black hat, which is clearly visible in the second of his two portraits included in this exhibition (see no. 10). Shakya Yeshe, renowned for his fund-raising abilities, used the gifts he brought back from China to help found Sera Monastery in 1419. In 1429, Shakya Yeshe returned to China, during the reign of Emperor Xuande (1426-1435), this time to the new northern capital at Beijing, where he demonstrated his abilities as a healer by curing the emperor's ills. He also toured the sacred mountain Wutaishan, Mongolia, and Amdo (present-day Qinghai province). In 1434, the emperor granted him another, even more exalted title (consisting of thirty-eight Chinese characters). The next year, in 1435, he died on his way home to Tibet. The earlier of these two images (see no. 9) is embroidered silk and shows the Lama as a younger man, seated in meditation on a lotus throne, with his hands in a gesture of preaching, carrying two lotuses at shoulder level, which support the bell and vajra. His hair is knotted into a chignon and he wears a three-leaf crown. He is surrounded by an elaborate "throne of glory," surmounted by Garuda (the mount of the Indian deity Vishnu and enemy of the nagas). In the upper corners of the embroidered portrait are images of White Tara and Vajradhara. The portrait was apparently remounted with embroidered silk that was once part of a Qing Dynasty imperial robe. The second and later of these two portraits is a slit-silk tapestry, which can be dated to the Xuande period (1426-1435), on the basis of the lengthy, woven title, which appears in both Chinese and Tibetan. This portrait shows Shakya Yeshe in the same posture and gesture as the first portrait, but here, he is cloaked in a sumptuously detailed robe with dragon designs and wears the Five-Buddha black hat (three Buddhas are visible here), recorded as a gift from Emperor Yongle. He sits on a Chinese-style throne similar to those seen in Ming Dynasty imperial portraits. On a typical Ming-style red lacquer table behind him, are an incense burner in the form of an ancient bronze vessel and an incense container. The large red seal that dominates the space above Shakya Yeshe's right shoulder replicates the Chinese-language seal given to him by Emperor Xuande.